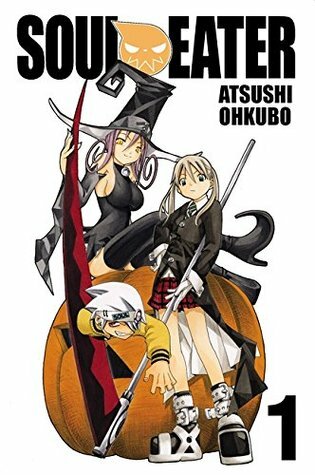 Image Description: The book-cover of Soul Eater Volume 1 by Atsushi Ohkubo. The background of the cover is white. The foreground is taken up with three characters sitting on/standing around a large orange pumpkin. Blair (a young woman with purple hair) is sitting on top of the pumpkin, she’s dressed in stereotypical “witch” fashion: thigh-high black boots with curved toes, a skin-tight black dress, and a wide-brim witches hat. Maka (a young lady with blonde hair in pig-tails) is wearing a shirt-and-tie, a tartan skirt, and a long billowy black coat. She’s holding a large scythe (handle is silver and the blade is red). Out of the blade of the scythe is the top-half of Soul (head, arm, and torso). Atsushi Ōkubo, also romanized as Atsushi Ohkubo, is a Japanese manga author and fantasy artist known for his work on the manga series Soul Eater, which has been adapted into an anime. Okubo worked as an assistant under Rando Ayamine, on the manga series Get Backers. He also created artwork for various cards for the Lord of Vermillion game. ~Interesting Art Style: I watched the anime adaptation first before reading the manga, and it’s good to know that it’s a faithful adaptation of the source material. The manga has a unique art style, particularly the sun and the moon, which appear to be living entities. It also has interesting choices for the main cast of characters: Maka and Soul, Black Star and Tsubaki, and Death the Kid with Liz and Patty (with a selection of background characters in a classroom setting who occasionally have their moment in the spotlight). ~The Power of Friendship: One of the core elements of the manga series is how people connect to each other. For a weapon meister and a weapon to be an effective team, their soul wavelengths need to match up and be able to attack/strategize together. The core six characters all have their vices and virtues, but it’s their bonds with each other that help them to solve problems, and drives the plot. While a relationship between a weapon meister and a weapon can be romantic (Maka’s Dad is a Death Scythe and her mother is a weapon meister), the relationship isn’t always romantic. ~Reasonably Good Plot Pace: I’ve read up to Volume 4 of the series, and we’re already embarking on a major plot thread, this is unusually fast for a manga series, usually manga series don’t have an obvious/active plot thread or character arc until around volume 7 – 9, however, this series is more action/plot orientated rather than character focused. Not that there isn’t any focus on character at all. For example: in Volume 2, we find out about Black Star and Tsubaki’s back-stories and about their families. All in all, an excellent fantasy adventure series with a lot of humour and interesting characters, I highly recommend this manga series especially if you’re just starting out with graphic novels and manga books.